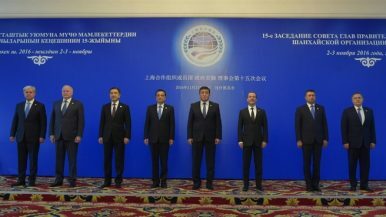 Premiers from across Eurasia were in Bishkek this week for the Shanghai Cooperation Organization heads of government meeting. Chinese Premier Li Keqiang reportedly said China was ready to discuss a free trade zone among the members. Judging from Russian Prime Minister Dmitry Medvedev’s comments, however, not all the SCO countries are so gung-ho. These routine get-togethers have routine outcomes — X number of agreements signed, recommitments to the “Shanghai Spirit,” and boilerplate statements about the threat of terrorism — but there is always the sideline and the subtones, the underlying issues that are up for discussion or in contention among the members. At a time when Russia and the Eurasian Economic Union seem to be fencing in Eurasia (with China on the outside of the fence), a free trade zone via the SCO would be quite a departure. The transition to a preferential trade regime within the SCO is a complicated matter given that any preferential regime always requires renunciation of internal decisions of one kind or another. We have agreed to continue our work in this area. All member countries’ business and financial communities should be fully involved in this work, primarily through the SCO Business Council and Interbank Association. Li had a different outlook. “We are open to cooperation and ready to discuss the creation of a free trade zone. This will help to remove trade barriers. They hinder the development of countries and the world economy,” he said, according to 24.kg, a Kyrgyz news site. The meeting will likely promote the establishment of an SCO free trade zone and enhance industrial production capacity cooperation between SCO members, He Weiwen, a senior research fellow at the Center for China and Globalization, told the Global Times. He stressed that by establishing a free trade zone, trade would be also greatly facilitated between countries along the One Belt and One Road route in Central Asia and the Gulf region. While free trade did make it into Chinese media summaries of the meeting, security was the headline item. Given that two months ago a suicide bomber attacked the Chinese Embassy in Bishkek, the focus on security was far from surprising. As Joshua Kucera detailed for EurasiaNet, the version of events laid out in Chinese media depicts Beijing taking charge, “and a Kyrgyzstan which was trying to keep China happy.” Kucera notes recent developments in the case have done little but cloud the picture further.